Test Suite titles in TestLink can be of 95 (or less) characters long. Therefore, you must limit requirement artifact titles to 95 characters or less while creating the requirement artifacts in TeamForge. Test Suite creation fails for TeamForge requirement artifacts with titles more than 95 characters. Select Create from the TESTSUITE drop-down list. The TESTLINK URL is auto-filled. Leave it as is. Notifications are added to the TestLink project's Activity Stream in TeamForge for your TestLink activities and events. The Execution History section lists date-wise test case execution data with a Submit Defect link to file defects for "Failed" test runs. Clicking the Submit Defect link takes you to the TeamForge Submit Artifact page. Note: Some of the test execution details such as the Tester's username, build name, time of execution and notes are automatically included in the artifact's "Description" field if and only if you have an active TeamForge session. Clicking Submit Defect just takes you to the TeamForge Login page otherwise. You can also trace associations using the "TeamForge Associations" link for every test case execution. 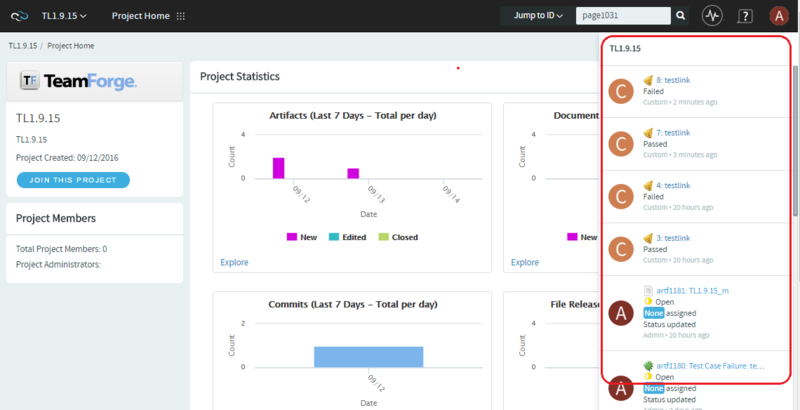 Click Submit Defect and file a defect in the TeamForge.